Okay, so in all fairness it's not my cookbook, but it is the first time an original recipe of mine will be included in a published book. A few months ago, I was contacted by the people at Posit Science who were putting together a book on food for brain fitness. They were looking for recipes from food bloggers that include brain-healthy ingredients and I was delighted to participate. The hardcopy of the book won't be available until July, but starting today you can sign up to receive their weekly recipe e-mails at http://www.thinkfoodcookbook.com/. Sign up and keep an eye out for the week that they feature the recipe from Apples and Butter. 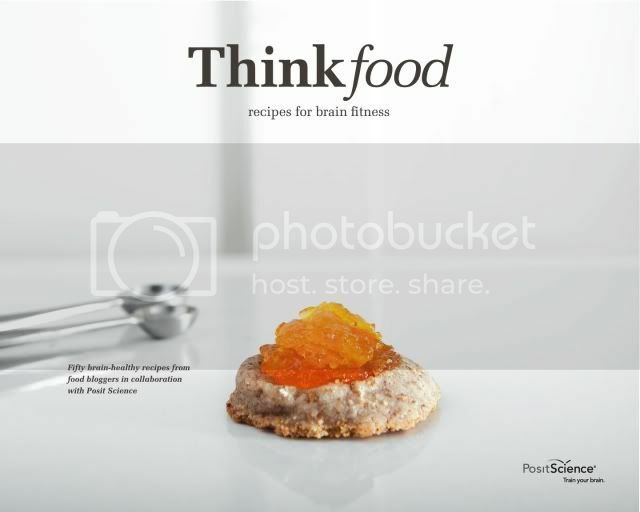 Be sure and stop back by here that week because I will be giving away a free copy of the ThinkFood cookbook. It's so awesome that your recipe was included. Congrats! Who doesn't want a healthier brain? I can't wait to see what the recipe is. How wonderful! Congrats! I just love your blog and now lots of other people will too! Congratulations. Can't wait to pick up a copy. I'm intrigued. Who wouldn't want to incorporate more brain-healthy ingredients into their diet. Congratulations! What exactly makes a food "brain-healthy," anyway? Congratulations! This is exciting news! Oh how exciting! I'm curious about this brain-healthy food. Can't wait to see your recipe! This is very exciting! Well done! I like the cover design.